A complete, practical guide to planning and executing an intensive longitudinal study, this book provides the tools for understanding within-subject social, psychological, and physiological processes in everyday contexts. 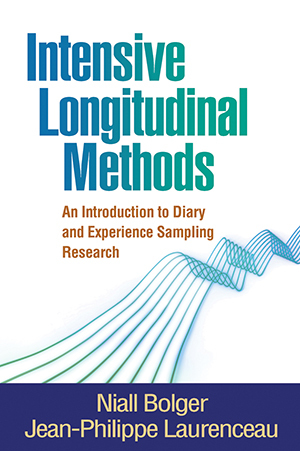 Intensive longitudinal studies involve many repeated measurements taken on individuals, dyads, or groups, and include diary and experience sampling studies. A range of engaging, worked-through research examples with datasets are featured. Coverage includes how to: select the best intensive longitudinal design for a particular research question, model within-subject change processes for continuous and categorical outcomes, distinguish within-subject from between-subjects effects, assess the reliability of within-subject changes, assure sufficient statistical power, and more. Several end-of-chapter write-ups illustrate effective ways to present study findings for publication. Datasets and output for the examples are available for readers' use at the companion website. The website also includes HLM, Stata, and R code as an alternative to the SPSS, SAS, and Mplus code presented in the book. This title is published by Guilford Press and is part of the Methodology in the Social Sciences Series. Buy the book: Amazon , Amazon UK, Barnes & Noble, or Guilford.